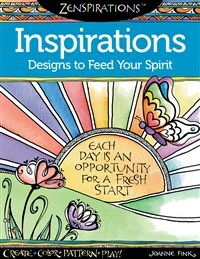 Let your spirit soar with 30 uplifting and encouraging designs in this extraordinary coloring activity book. Zenspirations(R) creator Joanne Fink reveals her easy-to-learn techniques for combining positive messages and playful patterns. So much more than mere outlines to color, exquisite Zenspirations patterns are launching pads of endless imagination and creativity. You don’t need to have the skills of an artist to create your own masterpiece here. After your patterning is complete, go ahead and explore color! Use the finished examples for guidance, or try your own interesting color combinations to create wonderfully motivating and meaningful art. Printed on high quality extra-thick paper, this beautiful and inspirational book is perfect for decorating with your choice of colored pencils, markers, or gel pens. Pages are printed on one side only, and are pre-perforated for easy removal and display.